The point of particular interest noted from a perusal of the reports from the Commanding Officers of the Battle Cruisers, and Light Cruisers, engaged in the action of the 31st May 1916, is that the Battle Cruisers were in action against enemy Battle Cruisers and Battle-ships, and that the three ships, “Indefatigable”, “Queen Mary” and “Invincible” that were lost, were blown up during the early part of the action when engaged with enemy Battle Cruisers. 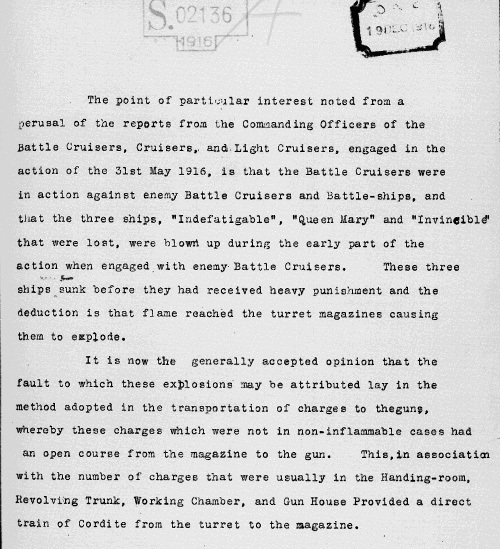 These three ships sunk before they had received heavy punishment and the deduction is that flame reached the turret magazines causing them to explode. It is now the generally accepted opinion that the fault to which these explosions may be attributed lay in the method adopted in the transportation of charges to the guns, whereby these charges which were not in non-inflammable cases had an open course from the magazine to the gun. This, in association with the number of charges that were usually in the Handling-room, Revolving Trunk, Working Chamber, and Gun House Provided a direct train of Cordite from the turret to the magazine. 4. Look at Source 4. This is a private Navy report on the loss of the Indefatigable. What ‘deduction’ was made about why the Indefatigable exploded? Charges are explosives. What was wrong with the way the charges were carried to the guns? What other factor contributed to the explosion? Write a newspaper report based on one of the following headlines.